Bernard de Raad has owned Cap’s on the Water in St. Augustine for 20 years. He is also a co-owner of 3 Palms Grille in Ponte Vedra Beach. I’m a Dutchman, born and raised in the Netherlands. My parents had a baking firm that started in 1830, so I was fifth-generation. But love broke the chain. I met a lovely American woman from Neptune Beach, which is the reason I went to the United States. Overall, I have a background in retail. I’m a baker at heart. I love good pastries, and I have that European taste that I think people look for here. I’ve now owned Cap’s for 20 years. It’s still that same view when we bought it 20 years ago. Over time, what we’ve tried to do, by improving the servers, improving the food choices, having a stellar wine list and expanding the place, is really make this a white tablecloth, outdoor restaurant without tablecloths. That’s the unique part of Cap’s. That’s why we’re a destination. 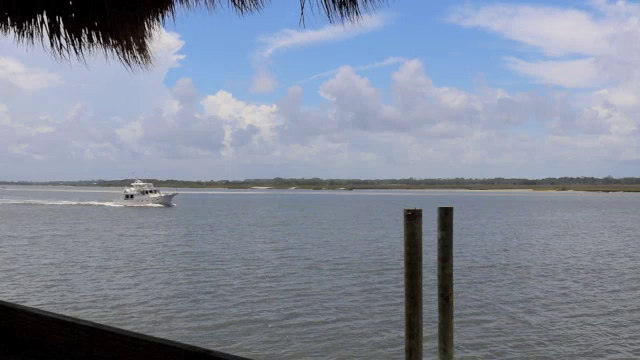 In addition, there are very few restaurants in the area where you can go to by boat and enjoy the water view. If you live in Jacksonville Beach or Palm Valley, it may take a 45-minute trip to get here. But, it’s worth it. We have that 100-foot floating dock where there is more room than ever. Overall, there are very few restaurants that are left on the water. How would you characterize the Cap’s menu? I call my cuisine new coastal cuisine. Seafood is the focus of the menu … fresh local seafood wherever possible. It’s an artisan-style menu with some European influences that you can find in the sauces and preparations. Overall, it’s a mixture of good old Southern food with some European finesse. That’s hard to say. I like everything on the menu, otherwise it would not be on the menu. I love our fried shrimp. I love our sesame-seared tuna. I love how we prepare our fresh catches and grilled octopus. There are so many different dishes, plus we add specials every week. We try to keep it interesting not only for the customers but for myself because we eat here three times a week as well. Can you tell us about your restaurant’s wine program? My wife and I started traveling and visiting vineyards when we had this restaurant a few years. I was more of a beer drinker, but then I started getting into wine. Now at Cap’s, we have a wide selection of more than 500 choices — very sought-after wines. We get recognized by Wine Spectator with two glasses for two reasons. The first is because of our selection. Also, if we buy a bottle for $100, we price it up $25. So, we sell it for $125, while most other restaurants would sell it a two-and-a-half-time factor. So that bottle would be $250 at a renowned steakhouse. So, you can come to Cap’s and basically eat for free because you can buy a nice bottle of wine and save $100.